The omelette. First, my wife Jan sautéed a bunch of mushrooms in butter, letting them get soft and tasty. Then she made a three-egg omelette and folded in the sautéed mushrooms. The croissant. It’s worth the drive from Daglan to the bakery in Castelnaud (a distance of about 10 kilometres) but of course it’s not something you want to do each morning. My solution is to buy several croissants at once, wrap them individually in cling film, and then put them in the freezer. The night before I want a croissant for breakfast, I take one out of the freezer, leave it on the counter over night, and zap it in the microwave for 10 or 20 seconds in the morning. As I did today. The surprising salmon. In the past, I’ve written about several of the delights we’ve bought at the new Fabrice le Chef boutique in Daglan, including his salmon gravlax. (For a full introduction to the boutique, just check back to my posting of March 29, called “Fabrice le Chef: Open for business.”) Gravlax is salmon that’s been cured (typically with salt and sugar) rather than smoked, and Chef Fabrice has made several types, including salmon that’s flavoured with dill, and salmon that’s flavoured with citrus fruits. Our latest discovery is gravlax betterave, or beetroot salmon gravlax. This is sliced salmon cured with orange and with a purée of beets (beetroot). The salmon glistens, the colour is amazing, and the flavour is lovely and mild. 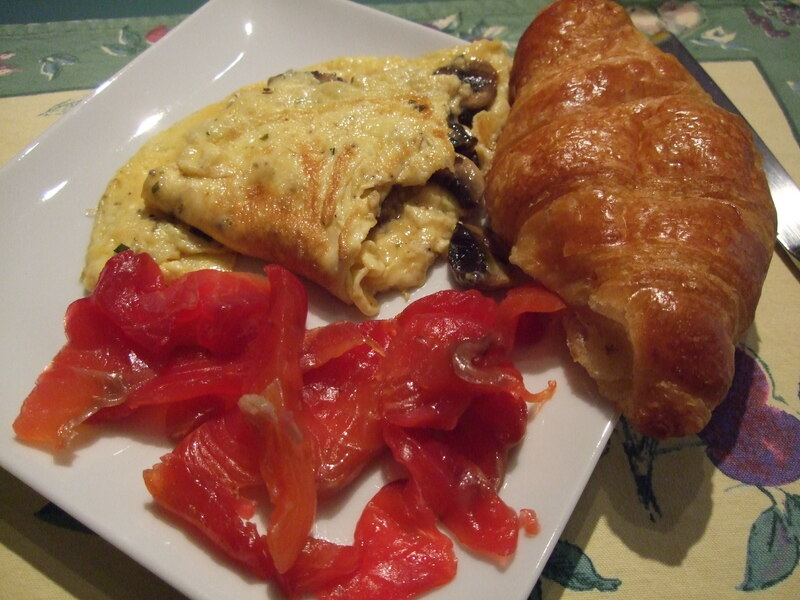 Mushroom omelette, croissant, and salmon. Yummy! And now you’ll have to excuse me: It’s time to head up to the main square, as today’s stage of the Tour de Dordogne races through our village. It’s not quite the Tour de France, but it’s quite a spectacle. This entry was posted in Bicycling in the Dordogne, Cafés in France, French food, Life in southwest France, Recipes, Restaurants in the Dordogne, Uncategorized and tagged bicycling, breakfast, Castelnaud, croissants, cycling, Daglan, Fabrice le Chef, Fabrice Lemonnier, food, French breakfasts, mushrooms, omelettes, salmon gravlax, salmon recipes. Bookmark the permalink. Thanks, you two. Keithster, it’s boiling hot here today, so the guys will be needing lots of liquids along the way. And as I’m sure you know, there are some tough hills on that route. I’ll be posting some photos of the Race through the Village tomorrow. Surprised you buy your croissants in Castelnaud. Has the boulangerie in Daglan closed? Sadly, no. Have you actually had one of the croissants from the Daglan bakery? They seem to come in two sorts — flaky crust on the outside but virtually completely hollow, or else sort of cake-like. They are no more real French croissants than corn syrup is real Canadian maple syrup. There — it had to be said. I have been visiting Daglan for some 15 years, eating croissants each morning from the village boulangerie. They seem to me just as good as those we buy elsewhere in France. I will be trying them again this year, very much bearing your comments in mind! Interesting, Doug. Well, all I can say is that you should try the croissants at the Castelnaud bakery .. or Patisserie Lucco (west of Beynac), often called the best in the whole region … or Banette in Cénac or the “wood oven” bakery in Cénac. Or virtually any of the croissants I’ve had from bakeries in Sarlat.